Even during their time away, you will have a great influence on your child’s exchange experience (positive and negative). A big part of this influence is how you react to your child’s experience with their host family and their reactions to adjusting to another culture. It is important to remember that your child is living with a family who has their own customs. It is very likely that their rules and ways of doing things are different than in your household. As discussed earlier in the “I never thought of it that way” blog post, there will be many things that your child will be getting used to. Your actions and reactions will influence their adjustment. Let’s look at the three areas of which students say they felt the most pressure from home: communication, the wishing to visit, and the emotional support structure. For more information on these topics and others, take time to read the Study Abroad Parent Handbook including the sections on “Preparing Your Child and Yourself” and “Appendix V” on Policies and Procedures. Allow your child to set the amount of communication—which may require patience on your part. This can be difficult when you want to know what is going on in their life. Yet, the less you hear, the better things are most likely going. Think about it - the more involved s/he is in making friends and participating in host family life, the less time your child will have communicating about it. Let them be in the present. In your communications with your child, be upbeat and ask questions about their activities and host family (even though you might not get answers quickly). They may be feeling conflicted about the choice of going away from home for a year or semester, so don’t use phrases that will increase that conflict like—how everyone wishes they were at a certain event. Your child can’t be in two places at the same time, so encourage them to enjoy the choice they made and the opportunities that present themselves because of that choice. While your child is living in another country, it may seem like the perfect time to plan an overseas vacation. It may be hard to imagine not seeing your child for a year or semester, and you want to see where you child is living. While this may seem like a convenient opportunity for a trip, you are not doing your child a favor with such plans. Dividing their attention between the host environment and the home environment is a challenging situation for any student; being confronted with both at the same time is a struggle that a number of students can’t deal with. It may cause homesickness and adjustment issues, sometimes to such a degree that students decide to follow their parents home rather than continue their exchange. Please don’t put your child in a situation where they need to tell you that they would prefer for you not to visit but grant them this time on exchange as their own chance to grow up. The hosting community could be an excellent destination for the next family vacation after your child’s return as a lot of our students love to return for a visit and are then in a much better place to show of their second home. 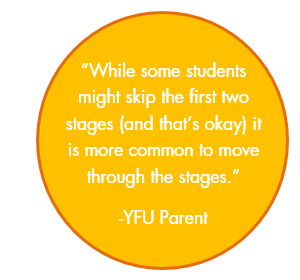 If you decide you still absolutely want to visit your child on program, please be aware that YFU requires you to consult with your Support Service Manager before making any bookings. Travel plans will only be accepted at the end of the exchange program and when they don’t interfere with school attendance or host family plans. A large part of your child’s success as an exchange student depends upon his/her willingness and ability to develop a support group in the host country. In order to do this, your child must be ready to break away from the support group that s/he has known and relied on his/her entire life. Likewise, the support group from home must allow your child some space. This will allow the host family and local Area Representative to develop a relationship with your child and be ready to take over the support role that you fill at home. If your child can build meaningful relationships with their support in country (i.e. host parents and Area Rep), s/he will have the necessary resources to succeed. Attitude can make a difference when going into a new home; learning a new language; and developing a new support network with new friends and new coping skills. Four things that YFU encourages in its students are sharing, respecting, learning and patience. By promoting an attitude that encompasses these, you are promoting a successful experience for your child.